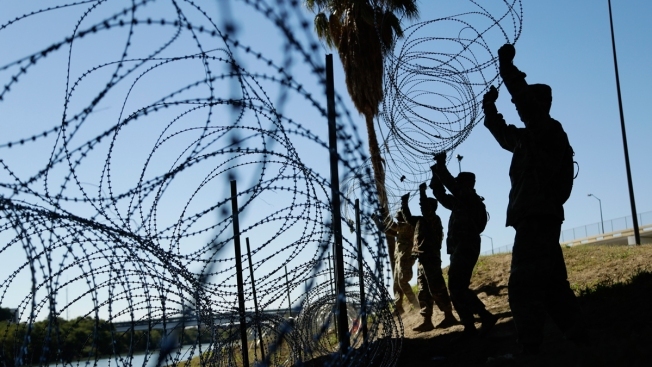 In this Friday, Nov. 16, 2018, file photo, members of the U.S. military install multiple tiers of concertina wire along the banks of the Rio Grande near the Juarez-Lincoln Bridge at the U.S.-Mexico border in Laredo, Texas. The Department of Homeland Security has requested more U.S. troops to be deployed at the border to add 160 miles of concertina wire on top of existing border fencing, according to three U.S. officials. If approved by Acting Secretary of Defense Patrick Shanahan, the addition of troops to enhance the fencing could extend the military's current deployment at the border until the end of September, based on the rate of construction, according to two officials. The military mission, which began two months ago, was set to end on Jan. 31, NBC News reported. The fencing that is to be reinforced with concertina wire is not new. The troops currently deployed at the border have already added concertina wire at ports of entry in Arizona, Texas and California. The request for troops to add an extra 160 miles of wire was first reported by NPR.